The unique character of the Marcy-Holmes neighborhood is created by its proximity to the University and the Mississippi River, and by its location in history. Bordered by the campus, the riverfront, and the East Hennepin commercial district, Marcy-Holmes is the city’s “first neighborhood,” rising with the 19th century milling district. It’s just a quick bike ride or walk across the Stone Arch Bridge to downtown Minneapolis. The neighborhood has three designated historic districts and is the home of Dinkytown, whose small shops, restaurants, and services are tailored to the University community. Marcy-Holmes appeals to students, condo and homeowners, seniors, families, and professionals. Its highly educated population has a history of civic involvement and political activism. Marcy Open School (K-8), a student-centered environment, emphasizes academic achievement as well as personal development, and promotes lifelong learning and individual goal setting in multi-grade classrooms. Natural Home magazine named Marcy- Holmes one of the “Country’s Top 10 Eco(logy)- friendly Neighborhoods” (2007). The Prospect Park Neighborhood has enjoyed a long history, dating back to the late 1800s when it was a commuter suburb to Minneapolis connected by a streetcar line. Residents today enjoy its urban village feel—a small town in the big city—where they can walk to work, recreation, shopping, and community meetings and events. Prospect Park has two community centers: Luxton Community Center and Pratt Community Education Center. Pratt is also an elementary school (K-5). Como is a neighborhood of tree-lined streets, an intergenerational place where people greet each other on the streets and in the stores. The neighborhood’s gardens, including the awardwinning Como Corners flower garden, welcome volunteer gardeners. Como is halfway between the St. Paul and Minneapolis campuses and close to either downtown (with bus connections to both). Many activities (Weisman Museum, U of M athletics, concerts, walking/ biking trails along the Mississippi) are within walking distance, as are a number of restaurants and cafes, both casual and elegant. Como is only a few minutes drive to two major shopping centers. Several co-op groceries are also nearby. Van Cleve Park is home to ball fields, lighted ice skating rinks, a wading pool, and playgrounds, and provides programs and recreation for all ages. Southeast Branch Library, Minneapolis Central Library, and two public schools are nearby. The University of Minnesota is one of the most comprehensive and prestigious public universities in the world. The state’s land-grant university was founded on the banks of the Mississippi River in 1851 and has grown to a statewide system of five campuses. Not only is the University committed to educating the next generation of world leaders, it maintains a tradition of public engagement by offering programs and initiatives that connect its discoveries and resources to citizens throughout the state and around the world. This includes the activities of nearly 100 research and outreach centers, extension offices, and locations around the state. 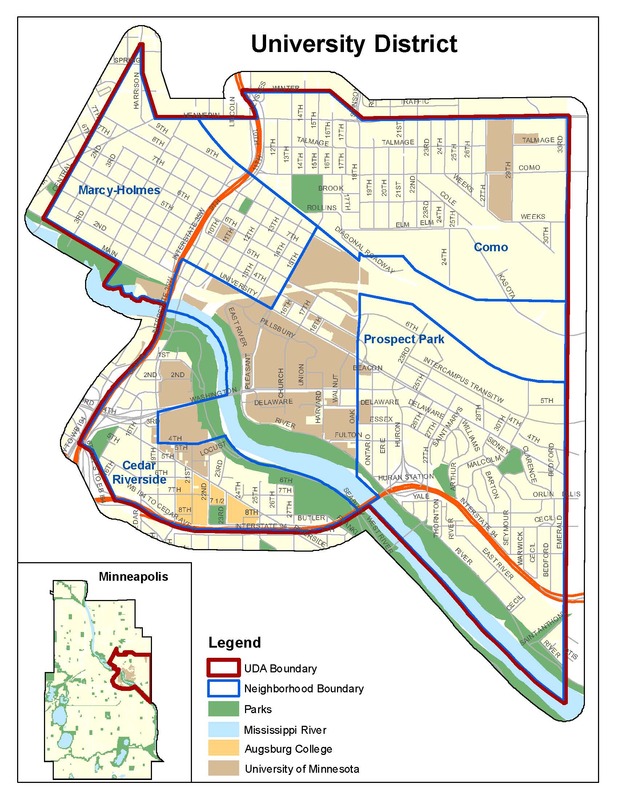 The Cedar-Riverside neighborhood, aka “the West Bank,” is located on the bluffs of the Mississippi River, east of downtown Minneapolis. Its history is nearly as old as the city itself. In the late 1890s, the neighborhood was known as “Snoose Boulevard,” a thriving community of Scandinavian immigrants, many of whom worked in the milling and lumber industries. In the 1960s and 1970s, the neighborhood became a beehive of hippies, intellectuals, actors, artists, and musicians. The towers of Riverside Plaza were the model for high-rise living of the future. Today, the West Bank boasts the largest community of immigrants in the Twin Cities, continuing its history of ethnic and cultural diversity. The West Bank is packed with venues offering live performance, music, and dance. Exotic shops and restaurants blend with traditional establishments. There are two two light rail stops in the neighborhood. The Cedar Riverside stop on the Blue Line and the West Bank stop on Washington Ave SE on the Green Line. This area has always been home to artists, musicians, and craftspeople, and continues this tradition as a center for music and theater performances. The University’s West Bank Arts Quarter, with its theaters and schools of music and art, complements the mix. The ethnic diversity translates into good food and shopping. Exotic shops and restaurants blend with traditional establishments. Dinkytown is located on the north side of the University’s Minneapolis campus. The heart is a fourblock area inhabited by a diverse array of businesses on University Avenue and 4th and 5th streets. People come to shop at the bookstores, eat at the local restaurants, or hear great music. A mix of old and new, large and small, and traditional and trendy, and rich in culture, history, and recreation. The area offers a small-town feel in a big city, with an assortment of diverse restaurants, shopping, art galleries, entertainment, and a fullservice premier supermarket. A thriving commercial district on the east bank of the University’s Minneapolis campus. Home of Gopher basketball and hockey, as well as aquatic and athletic facilities, Stadium Village is home to over 90 businesses.